The original Kilner Jars date back to the 1840s and were first invented by John Kilner and Co. in England. Sadly, the original company went out of business some years ago. However the Rayware Company now own the brand which they have built up not only to include preserving jars in the original Kilner style but also a range of Kilner bottles, Kilner jars, accessories, drinkware and home brew kits! In this category we have brought together all Kilner products from throughout our website. Our new range of Kilner drink dispensers in both 5L and 8L sizes and traditional or vintage styles has proved very popular with our customers. These Kilner dispensers are the perfect companion to Kilner handled drinking jars are ideal for barbeques, garden parties, weddings and much, much more. Now available in clear or coloured glass too! Kilner makes a wide range of products and we aim to stock a good selection. Some might surprise you. Whatever you buy you can be assured of the same Kilner quality and attention to detail. Our Kilner stock includes products for the homebrew market. Kilner Homebrew Bottles are stocked in a handy 750ml size and are available in packs of 6 or 12. Made in England, these are designed to work with crown caps or swing top lids, both of which are available in our dedicated Home Brew section. Kilner Homebrew kits are also available for Bitter, Cider and Lager. Each kit contains everything you might need, including caps, bar the bottles. For beginners, we also stock the Kilner Complete Starter Kit. Any of these make great gifts. Coloured glass plays an increasingly prominent role in the Kilner Range. We stock Kilner Clip Top Bottles in various colours including green, pink and blue in 250ml and 1L sizes. All these are sold singly or in packs of 3 or 6. Kilner Jars are also stocked. These have a separate metal sealing disc and screw band. This range is excellent for bottling and preserving. Various sizes are stocked including 100ml, 500ml and 250ml. All these jars have clear glass and are sold in packs of in packs of 6, 12 and 18 depending on the jar size. Handled jars are one of our most popular products and the Kilner range, in coloured glass, are perfect to be used as drinking jars for indoors or outdoors. Available in a 500ml size, these come in pink, green, blue or clear glass and are available in packs of 3, 6 or 12. Sold without lids, practical Kilner Flower Lids are available separately. Wide Range of Kilner Storage Jars Available! Another Kilner jar range we stock is the Kilner storage jars. With screw top or Kilner clip top jars and available in smooth or faceted jar styles, we stock a large range of sizes. These are especially recommended for storing dry food such as cereals. Kilner is of course synonymous with clip top jars and we also stock the coloured glass range in 500ml and 1 litre sizes in pink, blue and green. These are sold singly or in packs of 3 or 6. These are very collectable and also make fantastic gifts. Are you a fan of sloe gin or do you know someone who is? We stock Kilner’s Sloe Gin Gift Set. This 8 piece set is versatile. While it includes everything you need to make sloe gin, you can also use it to make other fruit liqueurs. The kit even includes muslin. Kilner thinks of everything! And so do we! We also stock a 250ml Sloe Gin Clip Top Bottle. It is sold singly. 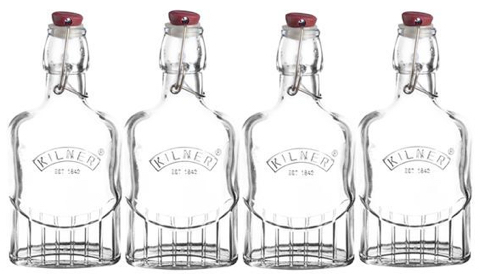 Other Kilner products stocked include jugs, pan racks, gift sets, hydrometers, cappers, siphons and a Kilner thermometer.